What a year! In years to come, we will look back at 2016 as a year where we lived through an important time in our nation’s history. 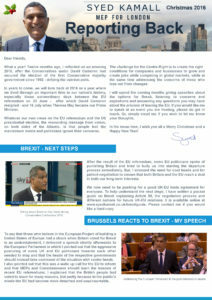 I will be spending the coming months giving speeches about the options for Brexit, listening to concerns and aspirations and answering any questions you may have about the process of leaving the EU. If you would like me to speak at an event you are hosting, please do get in touch via my Facebook, Twitter or email, details of which can all be found on the Newsletter.